Whether the passion is console free gaming, handheld devices in cozy bean bags, Giant Claw games with prizes to grab, high end PC’s, exhibit areas with unreleased games and hardware, table-top games, collectible card games, role playing games, or panel discussions with top-name gaming experts, PAX East is THE place to be. And Studio Blue was right there, too. Logitech, a popular provider of personal computer and tablet accessories with a Swiss origin and an American headquarters based in Newark, CA, hired Studio Blue to design, develop, ship, install and take down their tradeshow booth at the April gaming event. Logitech has an excellent rapport with Studio Blue, sharing strong business ties for ten years. 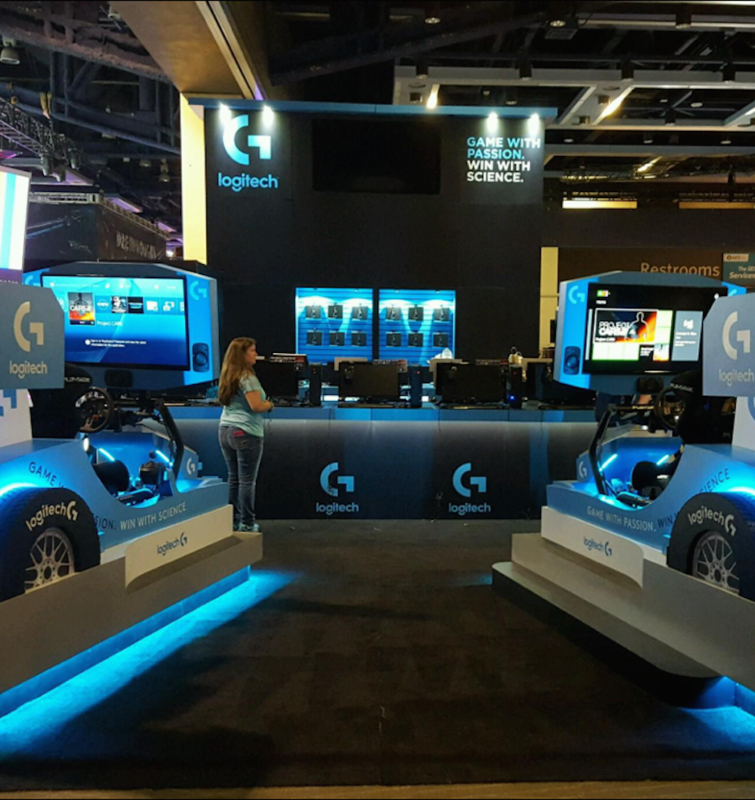 For the past 4-5 years, Studio Blue has been providing Logitech with their tradeshow booths for the gaming event, a project the print and graphic solutions company based out of Pleasanton, CA thoroughly enjoys. Studio Blue manager, Greg Betty, attends the gaming event in Boston every year, a testament to Studio Blue’s dedication and commitment to providing excellent customer support and full service solutions. One of the most popular features of PAX East was the display of 160 Logitech G 810 keyboards strung together to make one big screen. The 10 x16 wall of keyboards, whose caps were replaced with clear ones to produce an astounding light effect, displayed a two minute, 8-bit classic video game film which drew attention from the 67,600 people in attendance. Forbes Magazine wrote about the wall screen, dubbed the Great Wall of Logitech G, in their April 2016 edition and followed up with a May 2016 article about the keyboard and included a link for readers to view the video game film. For any business looking to expand its market and draw attention to its brand, tradeshow booths are a must have for any event or conference. With the many distractions from your competition, you want to stand out, literally, above the crowd with banners and sturdy, attractive, eye-catching booths that display your brand and logo in a way that makes your customers remember you over your competition. If you are attending an event and need a tradeshow booth or materials, please contact Studio Blue or visit us on our new website and take a look at our tradeshow graphics and display booths page. We have been in the business of helping customers just like you since 1954, and whatever ideas you can dream, we can bring to reality.